LG’s G6 received a lot of praise as the company took the risk of using last year’s processor on the phone even when the Galaxy S8 was all set to arrive with the latest chipset. It won’t be wrong to say that the G6 is not the phone that we can call company’s best phone of this year. Yes, the design is impressive, but still, lack of latest chipset means it somehow lags behind all the latest high-end phones of this year like Galaxy S8, OnePlus 5, etc. Now, everyone is looking forward to the launch of LG V30, and today; we finally have the LG V30 Launch date. Shared by Evan Blass on Twitter, the press invite of the device shows an image that reveals the outline of the design of the LG V30. 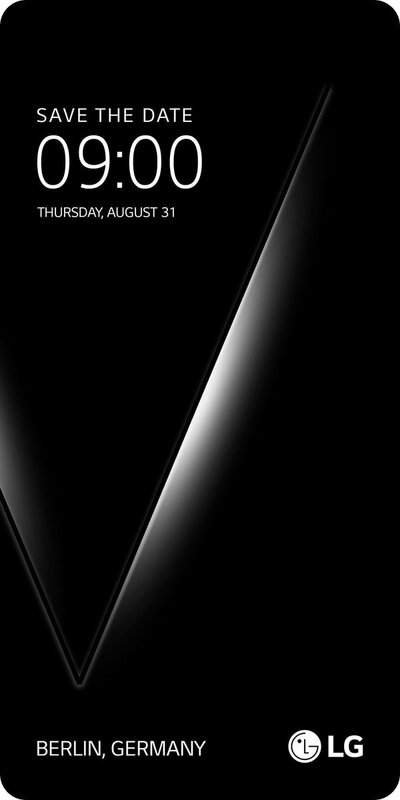 On display, ‘Save the Date’ is written along with the LG V30 Launch Date, i.e., 31st August. Keep in mind that IFA 2017 tech show is taking place in Berlin from September 1st to 6th and the phone. So, the phone is launching officially one day before the IFA 2017 kicks off. Interesting. There is not doubt the phone has the same 18:9 display but we hope to see lesser bezels and an OLED Panel. Also, as per the previous CAD Designs by Onleaks, it seems the LG V30 will put a stop to the secondary display feature of the ‘V’ series phones. Along with this, wireless charging is finally arriving with the LG V30 (as per sources). To compete with all the latest high-end phones out there in the market right now, the LG V30 will undoubtedly feature Snapdragon 835, 4GB RAM and Dual Rear cameras in the same position as on the G6. So, since the LG V30 launch date is out, what’s next? The specs maybe! Stay Tuned.